Vidalina Morales speaks to the crowd at the 2014 Independence Day celebrations in San Isidro. Source: James Rodriguez/Oxfam America. 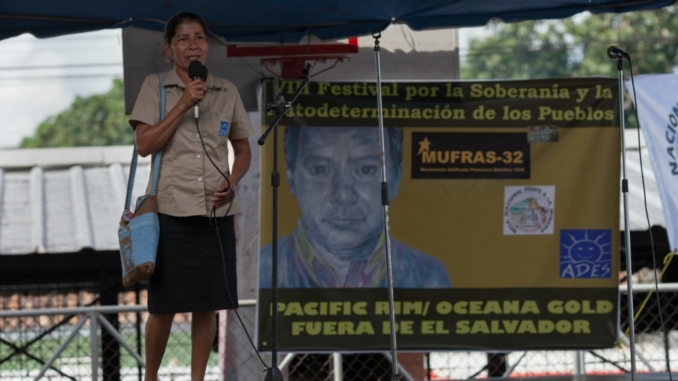 Vidalina Morales is an eco-feminist and leader of The National Roundtable Against Metallic Mining in El Salvador (MESA) who has fought against the damaging effects of metal mining in that country for the last decade. These effects include the contamination of water sources, higher rates of cancer in affected communities, damage to agriculture and fishing areas, forced evictions, and the breakdown of Indigenous and rural communities. In March of this year, MESA’s work helped push the country’s Congress to pass a historic nationwide ban against metallic mining, making El Salvador the first country in the world to do so. On Nov. 4, the Denver Justice and Peace Committee (DJPC), a longstanding human rights organization in the Rocky Mountain region, chose to honor MESA with the Global Justice & Peace Award 2017. Vidalina Morales’ leadership in that organization has been instrumental in the effort to protect the environment and envision a more just world for all.? I was able to sit down with Vidalina the morning after she received the award. Although small in stature,?you quickly sense her strength and resolve?as she begins to speak. Her voice is steady and her expression remains?calm as she describes the moving struggle of the environmental protection movement in El Salvador. LG: For you personally and as an organizer, what have the greatest challenges been? VM: One of the most challenging struggles in MESA has been an internal one in which women were not taken seriously and even disrespected by some who held traditional patriarchal notions of women as not belonging in leadership positions and instead belonging in the home. To be a female leader was a lot to overcome. When the MESA asked me to start speaking out as a leader, this was usually a position reserved for men and although the progressive MESA leadership wanted to push more women forward, at first this was very hard. I felt discrimination as a person in three major ways: First, for being a campesina; second, for not having a formal educational degree; and third, for being a woman. The discrimination was the result of not seeing the capacity that campesina women have. Thankfully, with the support of other strong female leaders in the movement, women began promoting women as leaders. The movement’s struggle is also one against patriarchy and internalized oppression …?Although it can be hard to break out of this system of oppression both external and internal, the sheer will to win for the present and future generations is what keeps women like me in the struggle. At first this new leadership role was very hard for me, as the men didn’t want to accept my leadership. Sometimes I would ignore their ignorance and sometimes it was my sheer will to struggle that kept me going. I knew that the struggle for the earth was a long-term struggle and was a fight for our future generations; this is what kept me going as a mother and as a community leader. I believe it is a virtue that women have to think not only of themselves but to also protect what they can for the future. This struggle is ours, it is one that we take to heart and perhaps only death can take us away from the struggle. Berta Cáceras, as an Indigenous woman, was also stigmatized and suffered machismo from her partner and others, but her inner strength allowed her to resist until the end. The movement’s struggle is also one against patriarchy and internalized oppression that also needs to be rooted out. Although it can be hard to break out of this system of oppression both external and internal, the sheer will to win for the present and future generations is what keeps women like me in the struggle. Future generations should have a better future than what my parents inherited. We have a damaged environment and it’s not ok to leave it this way as a damaged inheritance, thus we make a promise to do better. LG: One of the experiences you’ve talked about is the loss of four members of the movement who were murdered during the decade-long struggle. Can you talk more about that? VM: These murders included a female leader who was eight months pregnant along with her toddler, plus two other compa?eros. The names of these fallen warriors are: Marcelo Rivera, Ramiro Rivera, and Doral Alicia Sorto plus her toddler and an eight-month-old fetus – all of them forever Presente in the minds and hearts of those in the movement. Movement leaders also attribute the deaths of another eight community members to their involvement in the eco-struggle as well. LG: What have the greatest challenges been for MESA as an organization? ? VM: The greatest struggle is our effort to work across national boundaries with our neighbors Guatemala and Honduras. The struggle to preserve our water supply and environment cannot be accomplished with only a victory in one country alone. Rivers know no national boundaries and thus one nation’s enlightened environmental policies will not suffice to protect the water and land from polluters across national borders. MESA believes that with our first goal accomplished this can now give us the force and mandate needed to win our next fight, that of asking our neighbor governments to follow El Salvador’s example in outlawing all metal mining in perpetuity. 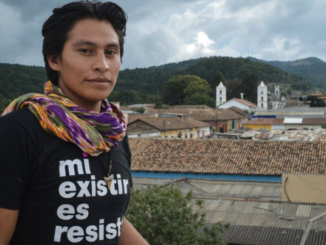 In this struggle, MESA is in contact with organizations in resistance to mining efforts in Guatemala and Honduras to try to agree on tactics as a united Central American coalition. Some of the challenges we face in creating these cross-border alliances are the lack of economic resources found in these developing nations. Still, we continue to move forward with what we can do, which by all accounts is quite a lot, given MESA’s massive victory in El Salvador. LG: What advice would you offer to other activists who are trying to build unity among their supporters? VM: What worked for us is the fact that the movement is united with one clear goal that was bigger than anything else, that of abolishing metal mining in El Salvador. The MESA coalition is also a very diverse coalition comprised of eleven organizations all of them with different skill sets, constituencies and contributions to the movement. Of all of the organizations, in fact only one of them has an exclusive focus as an environmental organization. The other members are a combination of community based organizations, religious groups, churches, and researchers. In addition, we had the support of all the national community based radio stations, twenty-three in all, who broadcast reports on the work of MESA throughout la lucha. This communication effort was critical in reaching people nationally and raising people’s awareness and consciousness around the importance of the struggle. But perhaps the biggest factor in our victory was when all of the separate efforts came together to form the umbrella organization of MESA. Having the leadership centralized gave us tremendous power as a united collective. LG: How can we in the West help protect environmental activists who are facing violence and threats? VM: International support is key. If international supporters denounce the human rights violations committed in Latin America, this can go a long way towards putting pressure on local governments. 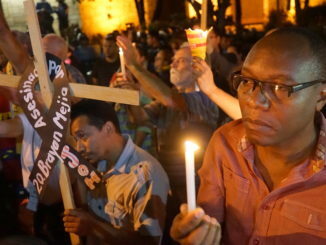 Too often in Central America, governments do not bother to investigate the crimes committed and even look to place the blame on the victims by smearing their names with lies such as accusations that the victims were involved with local gangs. 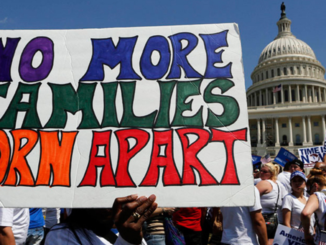 She further suggested that countries like the United States could help by granting asylum to those who need to flee for their lives. Organizations like the DJPC, can become aware and inform themselves and others on how transnational mining companies are acting in Latin America. This would be a great way to provide support. LG: What lies ahead for the National Roundtable? VM: The new goal for the movement is the struggle to make sure that the people in El Salvador know about the new law and that it continue to be unobstructed by whatever new government may come into power. MESA fears that the new anti-mining law is vulnerable as it can be overturned with a change in legislators. With new elections, there could be newly elected representatives that could upend the progress made. In addition, as the policy of the new law is being developed, MESA is advocating to be a part of the process. We are advocating specifically for the prohibition of all open pit mining as well as the sealing off of all contaminated areas and for restoration of the affected environment. In addition, artisanal minors, locals who mined independently for gold, are now unable to continue in this line of work, which is so hazardous to the environment. MESA is advocating for giving these miners new job training to assist the approximately one hundred or fewer people who are affected by the new law directly. In addition, MESA is advocating for water protection laws to protect the vulnerable water basins. There are still many communities that do not have water. MESA hopes to combat water privatization efforts. Private powerful industries are against such water protection laws in El Salvador, as they seek to profit from bottling water for sale as is currently being done. Lorena Gaibor is a board member of the เล่นคาสิโนออนไลน์ให้ได้เงินDenver Justice and Peace Committee (DJPC) and assistant professor at the Graduate School of Social Work (GSSW) at the University of Denver.